Sometimes you want to send the print job to both a PDF document and a physical printer. This article will show you how to do just that. 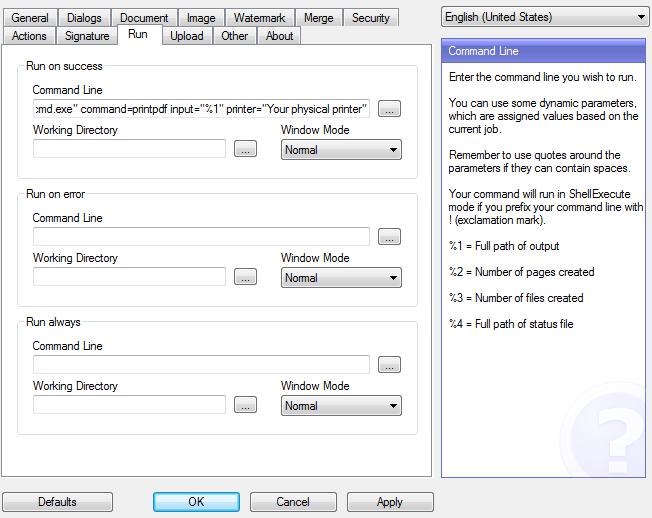 The idea behind the solution is that you use the Run on success setting to run a program that sends the PDF to a printer. There are different ways to send the PDF to a printer. The one used here is the command line tool PDFCMD.EXE found in the program folder of the printer. It has the following options. output                  File name of output PDF. A description of the Run on success setting can be found in the list of settings. "C:\Program Files\bioPDF\PDF Writer\pdfcmd.exe" command=printpdf input="%1" printer="Your physical printer name"
Remember to use the full path of the PDFCMD.EXE program. Please note that this solution does not work in all situations. There may be problems if you try to print landscape documents. In addition, the output is converted to a bitmap and does not keep the vector format used in PDF. Therefore, you will not get a good result if you try to send the output to a new PDF printer.